Thanks to Michael E. for this recommendation. Brief Synopsis – A Spanish knight works to help try and unite the Kingdoms of Spain against the advancing Moor armies. My Take on it – Mike has been trying to get me to watch this film for quite some time and finally found a way to do so. Charlton Heston was always a great actor in epic roles filled with religious undertones (or overtones) and this is no exception to that rule. He once again found a role as a leader helping his people through a difficult time. This is a great film that tells a gripping historical story all about love of country and family. The political intrigue is fun to watch and is peppered with lots of religious antagonism. Sophia Loren is also great here but the apparent hatred between the two actors off the set takes away from the romantic scenes that the two share because something is always missing in the chemistry between the two. The story itself is filled with patriotism that reverberates throughout which helps make this film heart warming. This film is over three hours but they do a wonderful job with the pacing in order to make it flow so well and not feel rushed or boring at all. Bottom Line – Nicely done epic film that tells a gripping story of love of country and family. Filled with political intrigue peppered with lots of religious antagonism. Heston and Loren are both great here despite their blatant hatred for one another behind the scenes. The story is filled with such patriotism that it reverberates throughout. This is a great story because it is able to take its time and doesn’t feel rushed or boring at all throughout. Recommended! 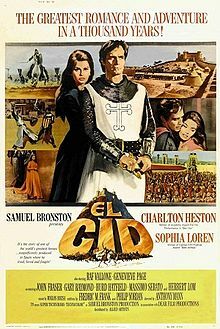 Rob – glad you got around to EL CID, and glad that you liked it. I had forgotten that it ran 3 hours. Obviously I never noticed that before. I love this movie (left a comment on Twitter as well). I’m a sucker for the great historical epics and this one was made during the heyday of the late 50s/early 60s. A Samuel L. Bronston special. I have a small bone to pick with you re: the chemistry between Heston and Loren. First of all – when the film was released – their off screen dislike for one another was not well known. As a matter of fact, I only heard about it when I read Heston’s autobiography. I had no idea. Your foreknowledge of the animosity may have colored the way you watched those scenes in the film. For me – they reeked of chemistry on screen (that’s called acting). Loren smolders and I think was more beautiful in this film than perhaps any other she made in her long career. Remember, there are long stretches in the film where she hates him (for reasons you know but I won’t reveal here to avoid spoilers for those who see it later). “Until then, my color will be deepest black”. And Rodrigo’s return of her handkerchief on the end of his lance is one of my favorite moments in the film. So the off-screen animosity may have been put to good use here after all. The action sequences are magnificent (one of the old time cast of 1000s epics) to go along with a riveting story of love, revenge, murder and gallantry. I’d single out a few more of the actors that you didn’t mention: John Fraser as Prince Alfonso – who could make you despise him with just a look at his face. Genevieve Page as his cutthroat sister Urraca, and Douglas Wilmer – who I loved as Moutamin, the Cid’s right hand man. Also, I can’t go without mention the soaring score by Miklos Rosza – I bought the soundtrack album and listen to it often while I write — and that final crescendo as El Cid gallops off into the sunset. Rosza was Oscar nominated for Best Score and Song for El Cid. He won the Oscar for Score for Ben Hur, for which Heston also won Best Actor – the only Oscar of his career. And in a final bit of trivia you might want to add – Rosza was the uncredited conductor for the musical score for “Time After Time”. So we come full circle. Lastly, I have a cousin who was a big time publicity man for many years for many film studios in Europe. One of his friends from his years in the biz is none other than Ms. Loren herself. Recently, my uncle (first cousins with the publicity guy), turned 90. For decades, he’s professed an enormous love for Sophia – telling his wife (my aunt) that she’s the only woman that he’d ever leave her for. His cousin used it to drive him crazy for years – talking about seeing Sophia, talking to Sophia, showing him pix of him WITH Sophia and telling him to “eat his heart out”. For his 90th – he came through. He contacted Sophia in Rome and had her autograph a 16″ X 20″ black and white (stunning) photo of her to my Uncle on the occasion of his birthday. “Much Love, Ciao, Sophia”. Needless to say – it was the hit of the party and now one of my Uncle’s prized possessions..